Here we are going to see some practice questions on divisibility by 8. If the last three digits of a given number is divisible by 8, then the entire number will be divisible by 8. 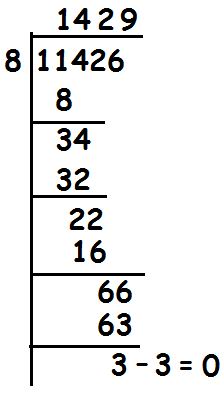 Which of the following number should be added with 1521 to make this number divisible by 8 ? Which of the following number should be subtracted with 11426 to make this number divisible by 8 ? Check whether the number 9000 is divisible by 8. 114_24 this number is divisible by 8. Fill in the blank with any following suitable digit. Which of the following number is not divisible by 8. Since we have 1 as remainder, we need 7 more to make this 1 as 8. Hence we need to add 7 with 1521 to make this number divisible by 8. Hence we need to subtract 3 from 11423 to make this number divisible by 8. All thousands are divisible by 8. Hence the answer us yes. If we put 8 in the blank space, we will get 824. Now let us check whether it is divisible by 8. 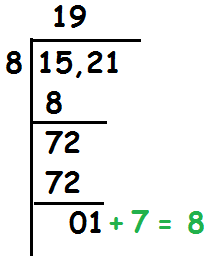 Hence, 8 is the suitable digit to be filled in the blank space to make the given number as divisible by 8. All thousands are divisible by 8, since 8 is added with 1000, it is also divisible by 8. The remainder is 4, it is not 0. After having gone through the stuff given above, we hope that the students would have understood "Divisibility by 8 questions"
Apart from the stuff given above, if you want to know more about "Divisibility by 8 questions", please click here.